With the year coming to a close and resolutions being written, I thought I would share some of the reasons why I think it's important to set goals and my top tip for successfully reaching them. I recently read a post about why you shouldn't write goals and I've been looking for it everywhere but I can't find it at all. Unfortunately, it was something I read while scrolling through Twitter and I didn't think too much into at the time but I really want to share my reverse argument. I've written New Year's Resolutions every year since starting this blog and I will continue to do so because I think goals are a great way to push yourself to the next level and succeed in milestones and wishes. What's interesting is that you are 42% more likely to achieve your goals if you write them down. 42%! That is HUGE! As you guys know, I am a firm believer in setting SMART goals and I genuinely think it's important for us to do that when thinking about what the goals for the year should be. Psychologically it is hard for us to work for something which our brain considers too far into the future so a timely goal might be one that's most crucial. Supposedly, breaking your year down into 90 day cycles makes it easier to achieve your goals. past the 90 day mark, subconsciously your brain doesn't recognise it as a factor that can impact today and so it's harder to work towards them. While, I personally love long term goals, I can relate to working harder for those that are more immediate. Finally, life can often get crazy and busy, and at times even overwhelming. Sometimes, things can take over and we can lose focus. In order to keep on track with goals, it's important that they have a prominent place in our lives. I find it useful to share mine on my blog so that I can be held accountable. I also have them as a list on my phone so I can keep a check of them. If you write them down somewhere in your home - perhaps a whiteboard - they will be seen regularly. This is great because they will become lodged in our consciousness. More effort will be put into them as there is a regular reminder and we are less likely to get side-tracked. Have you got any more tips to make sure you achieve your goals? 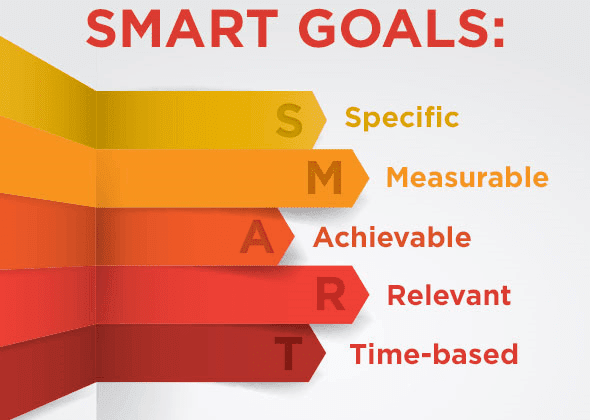 i've heard about making SMART goals before, but i loved how you combined that concept with 90-day sections and visual notes. Really helpful stuff! Aww yey! I'm glad you found it useful. I've learnt a lot from experience and other people's tips but I like to combine the ones I feel are the best!